The Clonmult IRA unit which was active in Middleton, County Cork, during the War of Independence. A group of IRA prisoners on board a British Admiralty tender docked in Pertland Harbour, prior to their transfer to Portland Prison circa 1921. Eamon De Valera and his party (from the left) R.C. Barton, Eamon De Valera, Count Plunkett, Arthur Griffiths and Austin Stack, having had successful talks with the British Government on the formation of an Irish Free State, return to Ireland on the Irish boat at Holyhead. King George V, at Belfast City Hall accompanied by Queen Mary to the opening of the first Ulster Parliament. 22/6/1921. 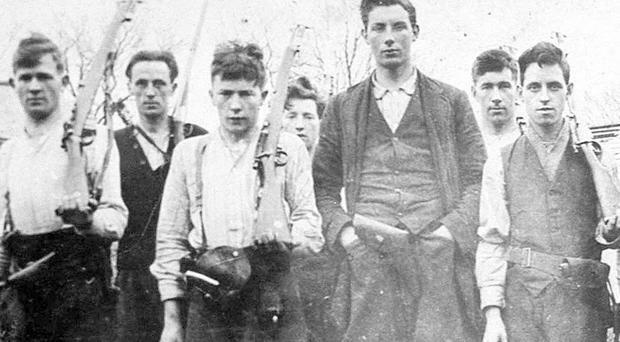 The notorious killing of 17 Protestants in west Cork during a War of Independence truce was not a deliberate act of ethnic cleansing, a new book claims. Author Barry Keane says that documents now indicate the bulk of the killings were in retaliation for the killing of the IRA's Commandant Michael O'Neill outside Dunmanway in April 1922. 'Massacre in West Cork' claims that some IRA units were so infuriated they struck out at individuals they suspected of being pro-British. In the four days after O'Neill's killing, 10 civilians were shot dead in Dunmanway, Ballineen, Clonakilty, Murragh and Bandon – all Protestant males aged from 16 to 82. Despite claims that the killings had a major impact on west Cork 's ethnic profile, with the local Protestant population dropping by almost 30pc between 1911 and 1926, recent research has shown that the majority of these were British military and that most native Protestants remained. "The online publication of the Bureau of Military History (BMH) files provides startling new evidence about the murders," Mr Keane said. He cites statements from Michael O'Donoghue, who worked closely with O'Neill in Bandon, and who later became GAA president. In one of the statements he names Herbert Woods as the man who fired the fatal shot. "Several prominent loyalists – all active members of the anti-Sinn Fein Society in west Cork and blacklisted as such in IRA intelligence records in Bandon, Clonakilty, Ballineen and Dunmanway were seized at night by armed men, taken out and killed (in retaliation)," the IRA man said.